This week’s blog hi-lights an exciting new collection for SOAS Archives – a personal collection of Mail Art by the contemporary visual artist, Hassan Musa, donated to the Library by Elsbeth Court. Many of the pieces are featured in a new exhibition at the Brunei Gallery, ‘Hassan Musa: the artist’s stamp’, which runs from 24th January to 23rd March 2019. En Taule avec des amis Hollandais [In Jail with Dutch Friends], Hassan Musa, 1993. Reference: MS 381333/3. Copyright in the artwork of Hassan Musa assigned to SOAS by the artist, 2018. Lecons Negociateurs The Good Negociaters [sic], Hassan Musa, 2007. Reference: MS 381333/50. Copyright in the artwork of Hassan Musa assigned to SOAS by the artist, 2018. Hassan Musa (b.1951), is well-known for his complex textile paintings and subjective calligraphy. For many years, his eye-catching hand-made works, often satirical, sometimes absurd, have been exhibited in innovative, international group shows and in commercial galleries. Hassan spent his childhood in provincial Sudan (El Nuhud, North Kordofan) where his father was a cattle trader. From an early age, he was intrigued by the variety of human imagery, inclusive of Arabic calligraphy, cinema and Chinese cultural magazines. He moved to Khartoum to attend the College of Fine and Applied Arts, Khartoum Polytechnic (K.T.I.). After graduation (1974), he worked for several years in media in what was a vibrant time for the expressive arts in Khartoum. In 1978, he moved to France for further education in fine art and art history, earning a doctorate from the University of Montpellier (1989) on the topic ‘The Shift in Cultural References to people in Central Sudan through the example of Contemporary Fine Art’ [Le Mutation des Reférences Culturelles Chez Les Citadins de Soudan Septentrional Le Cas Des Arts Plastiques]. Musa earned a diploma in art education (1996) and was a classroom art teacher for twenty years. He lives and works in southern France with regular visits to China where his son resides and Sudan where he shares an interest in Sudanese oral literature with his scholar wife Patricia. Musa is represented by Maia Muller Gallery of Contemporary Art, Paris. 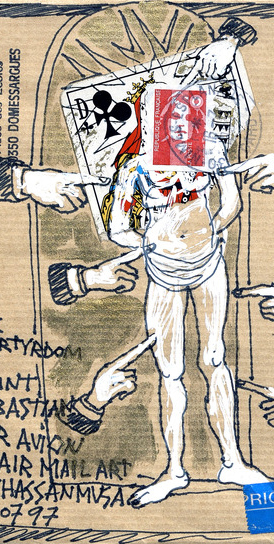 The Martyrdom of Saint Sebastian Par Avion By Air Mail Art, Hassan Musa, 1997. Reference: MS 381333/26. Copyright in the artwork of Hassan Musa assigned to SOAS by the artist, 2018. 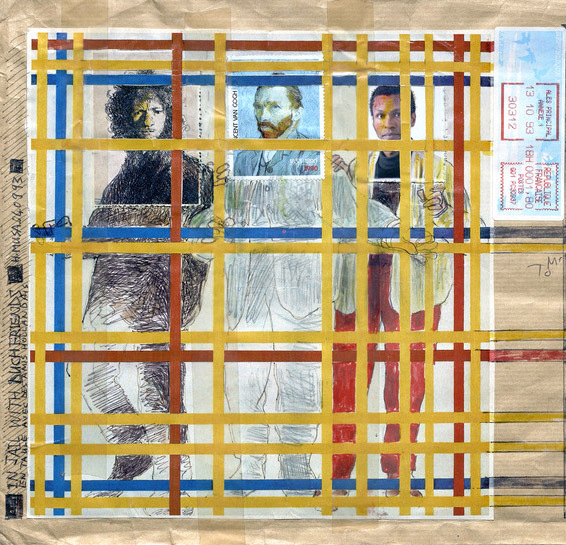 Mail Art, also known as Correspondence or Post Art, is a popular genre associated with anti-establishment activity during 1960’s New York that reached its peak in the 1990’s. It involves some kind of artistic enhancement of envelopes or post cards, often using stamps as elements in the composition. These small-scale works are sent through the regular mail as “free art” to surprise friends and all persons who glimpse at them along the way and afterwards. They are intended for an open audience, operating away from the commercial art market. Musa has engaged in this genre since the late 1980’s, keeping records of his works since 1992. The collection (Reference MS 318333), which currently comprises 58 items and dates from the 1990s to the present, was made to SOAS Library in June 2018 by Elsbeth Court, an academic who teaches African Art on the IFCELS course at SOAS, with the support and agreement of the artist Hassan Musa. It comprises items that were received and collected by Court who has known and worked with Musa since 1992, when he first exhibited in London and performed a ‘graphic ceremony’ in the old Assembly Hall, SOAS. Since then, he has enjoyed intermittent associations with the School including a mini-exhibition of his Mail Art during the opening week of the Africa’95 season (see Africa’95 Archive, Ref No: AF95, and the SOAS Archive: Centre of African Studies for ‘African Artists: School, Studio and Society’, Ref No: SOAS/CEN/01/01/40) and other cultural spaces and events in London. Digitised images from the collection are available on the SOAS Digital Collections, and following the exhibition in the Brunei Gallery, originals can be seen in the Special Collections Reading Room, SOAS Library.